Becoming a mother at age 16 taught Gbeni Taylor the importance of educating youth about family planning. Monrovia, Liberia—When Gbeni Taylor was 16, she learned she was pregnant and worried how she would tell her family. It was a frightening and uncertain time for her and one that she would wish on no other young person. She feared her father would throw her out of the house, but her mother and other family members ensured that she remained at home and attended night school to complete her education. 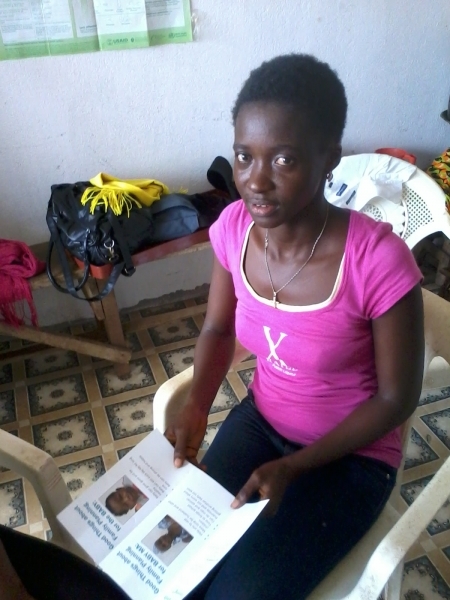 Gbeni’s experience is all too common in Liberia where, according to the most recent Liberia Demographic and Health Survey 2007, literacy rates are low and about one-third of girls ages 15 to 19 have begun childbearing. Gbeni’s life changing experience, as well as seeing her friends become mothers when they were too young, led the 21-year-old hair stylist to participate in an innovative program in Liberia to educate young women about properly spacing their families. The barber shop and beauty salon family planning program, an initiative under the U.S. Agency for International Development’s Maternal and Child Health Integrated Program (MCHIP), trains employees of beauty salons and barber shops to provide family planning messages, condoms and referrals to a nearby hospital for family planning services. A total of 16 workers have been trained in four salons and shops. Since 2012, they have reached 1,100 clients and distributed 16,550 condoms through this initiative. Since 2009, MCHIP has been working with the Ministry of Health and Social Welfare in Liberia to increase family planning services. In addition to training providers and strengthening their skills, MCHIP has identified effective approaches to increase family planning services and awareness using community-based distribution of condoms, birth control pill refills through marketplace volunteers, religious leaders to promote family planning, immunization and family planning integration, and the beauty salon and barber shop initiative.Through these efforts, 331,000 women have accepted a family planning method and health care access and quality have improved for more than 3.2 million Liberians. For hair stylist Gbeni, early intervention with youth is key. She believes that if people begin talking to youth about family planning, it will help them stay in school, get an education and delay having children. Through the beauty salon, Gbeni is able to reach both men and women, though women between the ages of 18 and 30 are her most frequent clients. When approaching the sensitive topic of family planning with clients, Gbeni begins the conversation by talking about local politics or the latest gossip. As her clients relax and join in, Gbeni gradually brings up the less-than-popular topic of family planning. She asks her clients if they are practicing family planning. If a client is not using a method but interested, Gbeni will counsel the woman, give her condoms and offer a referral card to the nearest hospital family planning clinic to receive a long-acting, reversible method. This referral card ensures that a woman will be seen quickly at the hospital for family planning services.